She appeared in Print ads in such publications as LIFE, LOOK, TV Guide and Sunset Magazine. Julia in a New Quick ad. Julia in an American Gas Association print ad. 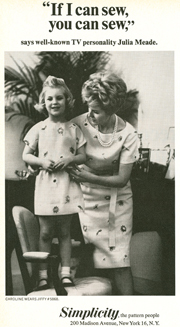 Julia and daughter Caroline in a Simplicity ad. Julia in a Ban-Lon carpets print ad. 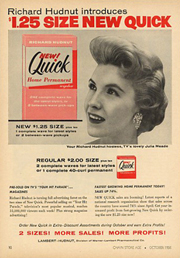 This is a trade magazine ad that features Julia on both sides of a page...she is photographed from behind for the teaser, and then from the front for the follow up, which is seen once the page is turned.